Cellulitis is a medical term for when the tissue just under the skin becomes inflamed. As you might expect, nasal cellulitis is the term for when this happens to your nose. The inflammation leaves part of the nose feeling thick, sore, swollen, and uncomfortable. How to handle this displeasing condition, and what to look for in case complications arise, is key for treating it successfully at home! Cellulitis is usually the result of either streptococcus (strep) or staphylococcus (staph) bacteria. These buggers are everywhere and are likely on your skin at this very moment. Staph and strep live, grow, love, multiply, and die on our bodies regularly but don’t cause any problems until they manage to actually get inside our bodies. This is accomplished as a result of cuts in the skin or openings such as insect bites. Excessive nose blowing, picking the nose, or injuries are likely the culprits behind how these bacteria get inside the nasal passages. People who play sports, where getting bonked on the face or even suffering a broken nose are not uncommon, are especially at risk of nasal cellulitis. Other medical conditions, like impetigo, can also increase your chances of developing cellulitis as scratching at the sores can easily create avenues for staph and strep to infiltrate the body. Additional medical factors to keep in mind are being immune-weakened, having recent surgery, or suffering from circulatory conditions that impair blood flow (this can result in cellulitis without any apparent injury). Going swimming while you have a nose injury, especially in salt water, can be a further cause. Nasal cellulitis most often presents itself along the bridge of the nose or around the nostrils. The affected area becomes red (“tomato red”), swollen, and may take on a “shiny” appearance. The skin will feel warm to the touch and blisters may also end up appearing. Cellulitis has a habit of spreading out from its initial location. From the nose, the most accessible points are the sinuses or membranes around the eyes. As a result, you may also develop a headache as the infection progresses. Your doctor will likely prescribe antibiotics and anti-inflammatories to treat the infection. It is highly advisable that you take these as prescribed and continue to do so until you run out or are told to stop. Since staph and strep bacteria have a number of antibiotic resistant variants, your doctor may want to run tests to see if you are dealing with a resistant strain or not. It is very important to not stop your treatment until your doctor tells you to. Stopping too early, even if it seems like the infection has cleared up, can lead to a relapse. Even though they don’t harm most people, staph and strep can cause some impressively dangerous conditions if allowed into your body. The reason doctors are quick to treat and test cases of cellulitis is because you can suffer serious complications should the bacteria manage to spread out and infiltrate deeper into your systems. For nasal cellulitis, the biggest risks are if the bacterium manages to get into the bloodstream or outer membranes of the brain. If it enters the bloodstream, the bacteria can cause septicemia, also known as blood poisoning. Once in the bloodstream, the bacteria and their toxins are able to circulate freely through the body and can trigger sepsis, a form of whole-body inflammation that can lead to dangerously low blood pressure, organ failure, and death. If the bacterium enters the brain or spinal cord, they can cause meningitis instead. This is an inflammation of part of the membranes along the brain and spine that can cause seizures, brain damage, shock, or death. You should always take the medicine prescribed by your doctor when dealing with cellulitis in order to avoid possible complications of the condition. Having said that, there is nothing wrong with employing some personal remedies to try and help the treatment move along. Cold fomentation: Take a clean cloth and dip it in a bowl of cold water. Squeeze out the excess water and place the wet cloth on the nose. Let it sit until it dries, then remove it. Doing this two to three times per day can help the pain and ease inflammation of the nose. Cold fomentation should be done shortly after the first signs of cellulitis appear. Aloe vera: Aloe is known to reduce inflammation. Applying a cream to the area can ease swelling. Note: some antibiotics come in cream form. If you are prescribed such a treatment, do not use aloe vera creams at the same time. Garlic, turmeric, and onion: All three of these have antibiotic and antioxidant properties. The latter won’t help for cellulitis but the former definitely can. Include at least one in each meal to improve your recovery. Vitamin C: Good for more than just scurvy, vitamin C is a strong immune booster. Enjoy citrus fruits or a good glass of orange juice each day. Since staph and strep bacteria are already present on your skin, you need to focus on protecting your nose. Mainly, try and keep your nose moist during winter when drying out and cracking is a big risk. 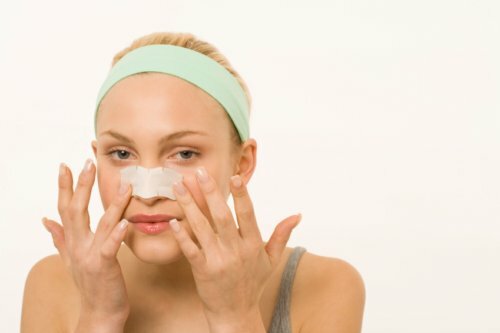 Avoid scratching at or picking at any marks, pimples, scabs, scars, or other skin conditions your nose can develop. If you do suffer a cut, clean it as best as you can and wear a bandage until it heals over. Lastly, pick your friends and not your nose! “Cellulitis,” MedlinePlus Medical Encyclopedia | U.S. National Library of Medicine web site; https://www.nlm.nih.gov/medlineplus/ency/article/000855.htm, last accessed December 10, 2015. “Cellulitis Of The Nose Symptoms: Causes And How To Treat It?” Simple Remedies web site, September 10, 2014; http://www.simple-remedies.com/skin-care/cellulitis-of-the-nose-how-to-treat.html. “Nasal Cellulitis – How To Recognize And Cure,” Health Care Avenue web site; http://www.cellutitis.org/nasal-cellulitis-how-to-recognize-and-cure/, last accessed December 11, 2015.